Window frame 1 composed of iron profiles with door gaskets, glass stops, double glass pane with the addition of beaten plates and hot forged. is ideal for smaller openings. Nice alternative to traditional French doors. One panel typically remains fixed, the other panel can be made as tilt and turn or tilt and slide. Tilt function provides effective ventilation of a room. ... the closing system based on all the four sides and to the integrated alarm. 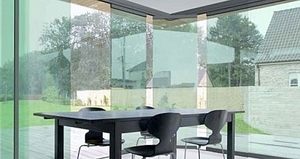 Further the employment of thermical- controlled glass guarantees an excellent isolation. Motored opening systems are also available for this collection. A sliding patio door is a space-saving alternative to a hinged door linking indoor and outdoor spaces. It may comprise a single leaf covering a small opening or multiple leaves which slide open, unifying interior and exterior areas. In homes, these doors can maximize interior illumination in winter and unify indoor and outdoor spaces in summer. They also increase visual contact between the two areas, which facilitates monitoring children. Door leaves may be connected to runners at the top and bottom. They may be frameless or have a PVC, aluminum or wooden frame. While frameless designs may be favored for their looks, framed models are less fragile and easer to see, increasing safety. When choosing a sliding patio door, consider installation configuration (existing or new opening) and ensure that the type of glass is suitable for the intended use (e.g., double glazing, shatterproof or security glass). Energy factors are also important. Shading or insulation may be needed to reduce heating in summer, especially if the doors are closed and in direct sun. Consider whether a fully transparent or framed style will better complement the space.